There are several tasks involved in this recipe. The one that will take the longest is cooking the fish, so start with that. Take your pound of frozen tilapia out of the freezer. Put it on a plate, and then put it in the microwave to defrost for about twelve minutes. (Microwaves vary, so it’s better to use the defrost button, and let the microwave tell you what to do from there.) While the tilapia is defrosting, make a white sauce. 2 cups almond or regular milk. Measure the flour into a small saucepan that is on a burner turned to a low medium heat. Add the butter and whisk the flour and butter together until there are no more lumps. This will take about two minutes. Don’t leave the flour/butter mixture on the heat for any real length of time, other than to melt the butter, or it will start to burn, and that just doesn’t taste good with fish–so turn off any heat under this saucepan until you have heated the milk. Put a larger saucepan on medium heat and pour two cups of milk into the saucepan. Start peeling potatoes and chopping onions. When the milk starts to steam, pour it into the smaller sauce pan, little by little, whisking it together slowly. Finally, pour the whole thing into the larger saucepan and leave it over the lowest heat on your stove. Once you have made your white sauce, take the fish out of the microwave. Line a toaster oven pan with tinfoil and arrange the fish on the tinfoil. Set the toaster oven thermostat at 375, and leave the tilapia in the toaster oven for eighteen minutes total, or about nine minutes a side. While the fish is cooking, finish peeling the potatoes, and slice them thickly; peel a turnip, and slice it thickly as well; put the potatoes and turnip into a microwave safe dish large enough to hold the potatoes. Put the dish on a plate and put it into the microwave. Put another plate on top as a lid, and set the microwave to run on high for twelve minutes. Chop the onions. Put them in a cast iron pan with a little more butter, and then turn the heat under the onions to a low medium–you’re trying the soften the onions for about twenty minutes. Make sure you turn the tilapia and bake for another eight to nine minutes. Turn the stove on to 400 degrees fahrenheit, and let it preheat while you are softening the onions and flaking the tilapia. Make sure to stir the onions every few minutes. Put the flaked fish in the white sauce in the large saucepan that is on low. Carefully remove the potatoes and turnip from the microwave. Drain. 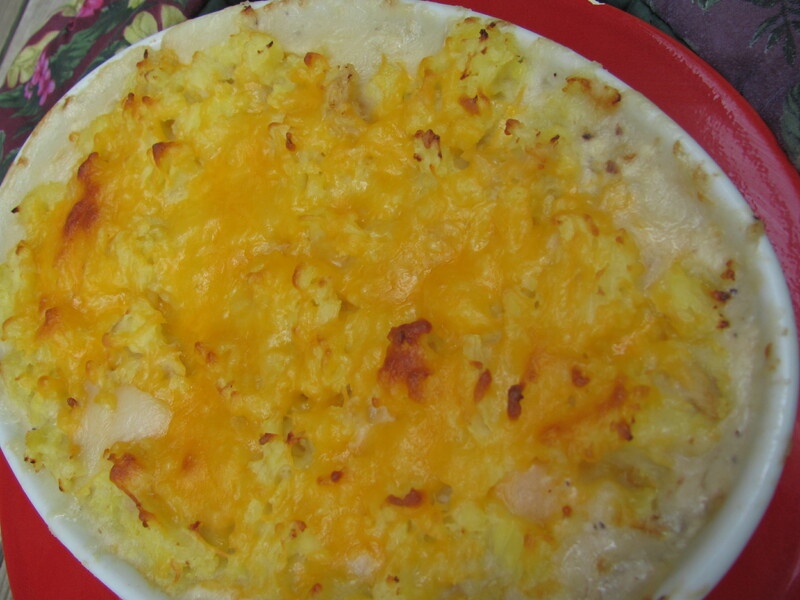 Mash the potatoes and turnip together into mashed potatoes, being careful to get out the lumps. Finally, the onions should be softened. Put the softened onions in the white sauce with the tilapia. Salt and pepper to taste. Pour the fish/white sauce/onion mix into a large baking pan, and using small teaspoons of mashed potato, cover the top of the fish with the potatoes so that you have a crust. (This is tricky. Only use a little bit at a time, or it will sink into the mixture, and then you won’t have a pretty crust.) Finally, sprinkle cheddar cheese over the top and put the whole thing into the oven for about twenty minutes or however long it takes you to wash that mountain of dishes. When it’s a little brown on top, you know it’s done. Cost: About $1.40 a serving. *I can’t figure out why anyone would actually eat turnips by themselves.